Forth & Clyde Canal - this includes The Kelpies and The Falkirk Wheel. This starts at Bowling on the River Clyde and enters the River Forth via the River Carron at Grangemouth. We undertake inspections on the bascule bridges. Crinan Canal - This starts at Ardrishaig near Lochgilphead and exits into the Western Isles at Crinan. Caledonian Canal - This starts just north of Fort William and exits at Inverness, travelling through many lochs including the famous Loch Ness. 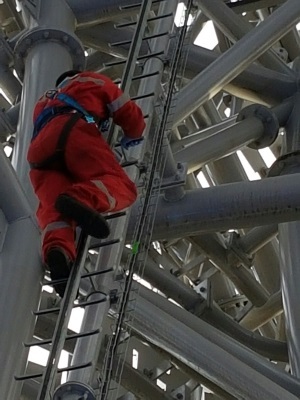 As part of the inspections, we carry out the examination of the Ladder and Fall Arrest Glideloc system inside both of the Kelpie heads. This system allows access up through the inside of the heads for inspection of the supporting steelwork, as you can see from the photos. Copyright © 2018 Speedy Hire Plc. All rights reserved.